Marion Verhaalen : Bio & Choral Music | Santa Barbara Music Publishing, Inc.
Marion Verhaalen (b. 1930) is a teacher, author and composer in Milwaukee, WI. 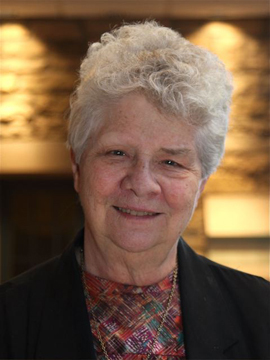 She has taught choral music at the elementary and high school levels, and has taught at Alverno College and the Wisconsin Conservatory of Music; presently she teaches piano at Cardinal Stritch University in Milwaukee. She holds two degrees in piano performance from Alverno College and Catholic University, and a Doctorate in Music Education from Teachers College, Columbia University. Her doctoral research was in Brazilian Music—she has several books published on this topic and has given piano pedagogy workshops throughout Brazil. Among her compositions are numerous piano works, six song cycles, and choral works including an oratorio Judith and a children’s opera Under the Greenwood Tree. Marion Verhaalen has 2 titles published with Santa Barbara.